No surprises: a new study highlights beef as the main culprit when it comes to food-related greenhouse gas emissions. According to the research, regular beef eaters are responsible for more than half of all food-related emissions. The CO2 emissions for different types of foods, according to a study by Chine, Crossin, and Verghese. We don’t often think about it this way, but the food we buy is not just food. Producing, packaging and shipping food consumes a lot of resources and generates massive emissions (a 2012 study found that a third of our emissions comes from agriculture). Not all foods are made equal, however, and some are much more taxing than others. Red meat, in particular, is a problem — not only is it bad for your health, it’s also bad for the environment. In terms of emissions, one study found that red meats are 150% more greenhouse gas intensive than chicken or fish — and against fruits and vegetables, they fare even worse. All in all, red meat (and especially beef) are the big problems when it comes to food emissions, and this new study confirms it. “A big take home message for me is the fact that high-impact diets are such a large part of the overall contribution to food-related greenhouse gases,” said U-M researcher Martin Heller, first author of a paper published March 20 in the journal Environmental Research Letters. A University of Michigan and Tulane University study showed that the 20 percent of U.S. diets with the highest carbon footprint accounted for 46 percent of total diet-related greenhouse gas emissions. Image credit: Martin Heller. 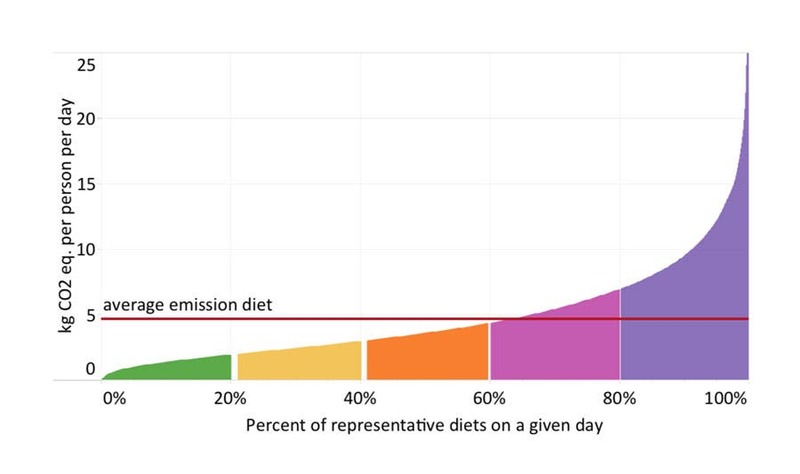 This food emissions distribution is not exactly surprising — you’d expect the highest quintile to cast a big shadow — but the study also offers important insight as to how these emissions could be reduced. 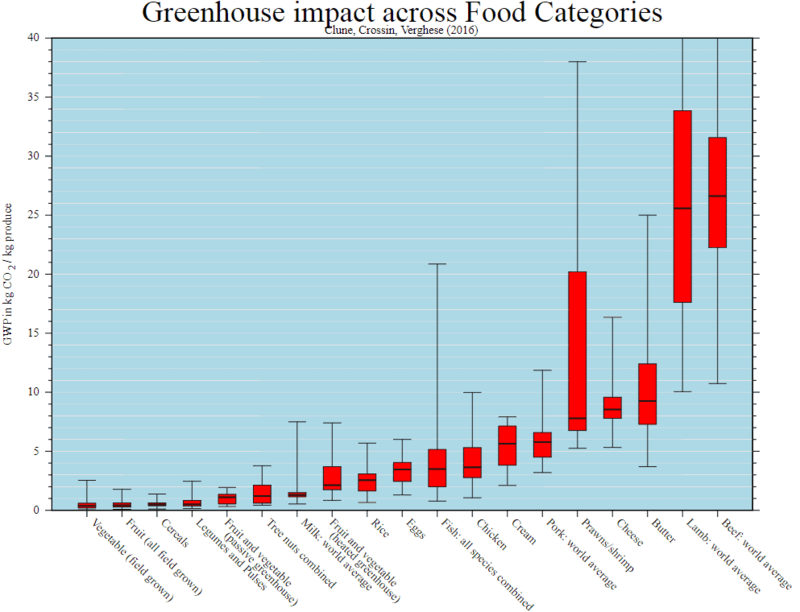 Meat accounted for 70 percent of the food-associated greenhouse gas emissions in the highest-impact group but only 27 percent in the lowest-impact group. If Americans in the highest-impact group shifted their diets to the American average, it would make a big difference, approximately equivalent to eliminating 661 million passenger-vehicle miles every day, researchers say. “Reducing the impact of our diets—by eating fewer calories and less animal-based foods—could achieve significant reductions in greenhouse gas emissions in the United States. It’s climate action that is accessible to everyone, because we all decide on a daily basis what we eat,” said Heller, a researcher at the U-M Center for Sustainable Systems in the School for Environment and Sustainability. Interestingly, the highest quintile also ate much more than other groups — 2,984 versus 1,323 calories per day, compared to the lowest quintile (note that even calorie-adjusted, the highest quintile group still emitted much more than the other groups). So the people who are over-eating are also eating too much meat. While the current study didn’t analyze this, it also seems quite likely that this is also posing serious health issues for many Americans. Journal Reference: Martin C Heller et al. Greenhouse gas emissions and energy use associated with production of individual self-selected US diets.